Anyway, yesterday I shared my love and a little bit of my collection with my female colleagues. I already had several perfume-y coffees with one who then spread the word. 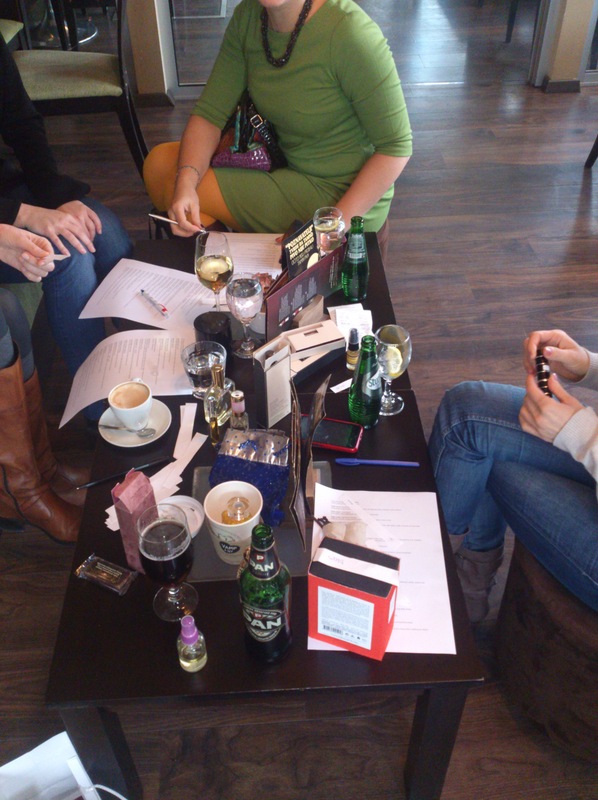 So that is how yesterday I ended up giving them a crash course through what perfumery offers if you know where to look. I admit to being ambitious and offering them 22 perfumes to try. 😀 That was mean of me. 😉 And they did! I never expected them to find anything to love among them, my goal was to make them understand how many more notes and possibilities exist out there and that they should try and figure out if they possibly like something and might want to discover more. What I learned surprised me. 🙂 It seems people (women in this case) are fed up with sweet perfumes. That was what everyone kept saying, I don’t want anything sweet. And the general consensus on what they found good was also surprising (although it shouldn’t be as I love it as well). That was Monegal’s Cuirelle. 🙂 Closely followed by Tom Ford’s Tuscan Leather. We agreed to meet again with a selection geared more toward spring and summer in a couple of months. I definitely hope to keep this up until their perfume vocabulary upgrades from: It’s interesting/ok/sweet/too much, to – Oh, I smell white flowers/amber/green stuff, etc.. This is fabulous, Ines. Good on you. I bet you’re all going to get a lot out of these little fragrant sessions. Oh and well done for bringing Tubereuse Criminelle. That would have been fun and opened up their horizons in one swift sniff! If I do say so myself, I think it was a bit eye-opening for most of them. Sounds like the ladies you met with really enjoyed this, Ines. Good for you! I never tried it in winter but now I will. Although we’re not actually having winter. It’s been rather warm for the past couple of months and a cold spring is basically here for a while now. My insights in almost every perfume is: interesting/ok/sweet/too much but I hope I will change it eventually, because that is so much you can sense just by smelling it is amazing! I still remember when I first started smelling perfumes for real and reading the reviews, thinking, that’s not possible, how can anyone smell all these things?! I don’t get any of that. Oh what fun!!! And I love hearing all the comments. Cannot wait to read about your next session. You’re doing a good thing: keep converting one person at a time! And keep telling us about it. He, he, I was actually thinking the same thing so I checked. 🙂 It was Vamp a NY. I was surprised as well. I actually checked many of their perfumes after hearing the associations – just to be sure they are smelling what they say they’re smelling. As just another human being who is younger you, of course, cannot know better! I’m well familiar with that one. But! If something is your hobby to which you pay a lot of attention and for which you spend a lot of time might take off that age prejudice. They still will think that you’re weird for having these knowledge and hobby but they might be inclined to listen. You got the part about people thinking me weird quite well (not just when it comes to perfumes, many people think that when they hear how much time I spend reading). As a bit of a perfume evangelist myself – albeit usually one-on-one – I heartily approve of this gathering with your colleagues to share the love. Great idea to stage one in summer too. Given that you and I have pretty divergent taste, I wonder what they would have made of any selection I’d have brought along – ‘wot no leather’ and ‘too sweet’, probably! Yes, it is weird, as I get older, I am being more drawn to sweet perfumes, not less. Oh, and I like the lady’s style – the one who teamed her green dress with orange tights. And the glasses of wine! Oh, the girl in the green dress is actually Russian and has an incredible dress style. And is more into perfume than any of the others there. I think whatever you would have brought with yourself, there would be something for them to fall in love with. It’s actually the novelty that appeals to most newbies to perfume world (I would think). That is great idea! It is good to give them very different perfumes, that allows wider look to the matter. If you don’t try enough different perfumes you can hardly decide what you actually like. Very, very good! That was exactly my thinking. It’s hard to know what you like if you always smell the same stuff.